An Iowa-made movie that revolves around the unsolved axe murders of eight people in a southwest Iowa home decades ago is finding a new audience overseas. Kim Busbee, co-writer and producer of “Haunting Villisca,” says she’s become acquainted with the owner of a film distribution network in Europe. She shows American films in English to bilingual audiences in Austria and Germany and got “Haunting Villisca” into a film festival there, while plans are in the works for a premiere next month in Vienna, Austria. 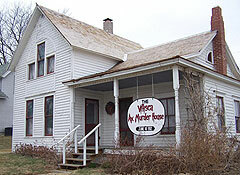 The movie transposes a fictional modern storyline of a man coming to grips with his wife’s suicide over re-creations of the 1912 slayings of two adults and six children in the small Villisca house. Busbee, who also plays a small role in the film, says she’s thrilled to be reaching a wider audience at last, as the movie was first shown in the Villisca theater back in March. The film will premiere in Vienna on January 9th in one of Europe’s oldest theaters. Busbee, of Des Moines, says they’re getting lots of press overseas and they’ll be featured soon in a magazine in Vienna called “Skip” that’s similar to the Hollywood publication, “Variety.” She says this new international exposure to the mysterious axe murders will undoubtedly spark more tourism for Iowa. She says an Los Angeles-based company has picked up “Haunting Villisca” in a worldwide distribution deal which includes possible DVD, TV and cable deals. To learn more, see the film’s website .